We're well aware that a major risk to investing in an oil and gas company is the volatility of commodity prices. 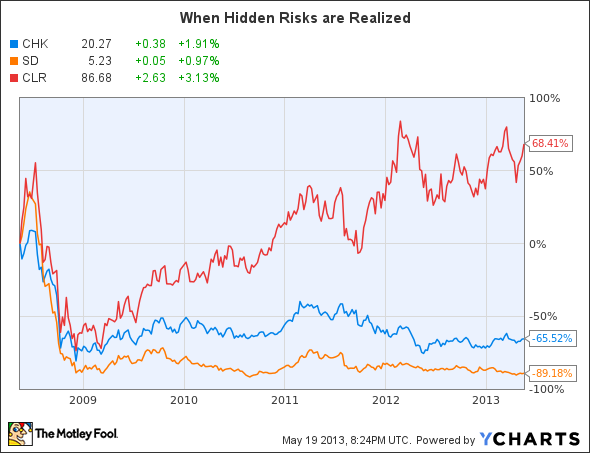 That risk, however, can be compound by a hidden risk that can really ruin your investment. As an investor you're likely keenly aware of the fact that plunking down your hard-earned money for a sliver of ownership in a company involves risk. The amount you're investing for your share of the company could decrease in value significantly, and a worst case scenario could lead to your investment becoming worthless. That's why it's so important to consider what could go wrong ahead of time so you have an idea of what to watch out for as you hold your position. That's why I love the quote by Carl Richards in which he reminds us that "[risk] is what's left over when you think you've thought of everything else." All too often we only look at what could go right and typically don't dig too deeply into what could go wrong. Instead of being reminded that the real risk is something we are not considering, all too often we are blindsided by a risk that was hiding in plain sight. If you are like most investors, you have some sort of energy exposure in your portfolio. You're well aware that oil and gas prices are volatile -- I think most of us would label that as risk No. 1 when investing in an energy company. When listing what might go wrong you've likely thought about the environmental risks or the geopolitical risks, but I'd be willing to bet that few investors have ever considered the role that related party transactions can play in poor investment returns. Sure, we probably all know the story of Chesapeake Energy's (NYSE:CHK) former CEO Aubrey McClendon. From the Founder's Well Program to a sale of an antique map collection, there were several instances where the company was engaged in questionable, related-party transactions with its CEO. Yet, if natural gas prices had never collapsed then none of these questionable activities would likely have mattered to investors. Unfortunately, the risk that was missed is that McClendon's attention was not always on the company; in hindsight investors might have realized that all these related-party transactions might not have been in the best interests of all stakeholders. The problems with related-party transactions don't end with Chesapeake. Another one of its co-founders, Tom Ward, has more recently been questioned by investors for his dealings with the company he now leads: SandRidge Energy (UNKNOWN:SD.DL). At the behest of activist investors, the company has hired an independent firm to review an assortment of related-party transactions between Ward, his family, and SandRidge. If the newly expanded board doesn't like what it finds, Ward could be removed as CEO at the end of next month. One of the major issues that activist investors have with SandRidge, other than poor stock performance, is that Ward's family owns 475,000 acres in the Mississippian adjacent to SandRidge's acreage. For perspective, that makes it one of the five top acreage holders in the play. The concern is that this company could be front-running SandRidge in acquiring acreage, which could have a negative effect on SandRidge. Further, SandRidge could decide not to develop some of its acreage, let it's leases expire, only to have Ward's company pick that acreage up. Because he has inside knowledge, this is an apparent conflict of interest. Stories like these don't end there. The drilling boom has created a lot of wealth for the founders of oil and gas companies which they've used to diversify into separate entities. Another example of this is found at Continental Resources (NYSE:CLR) whose CEO, Harold Hamm, happens to also own a pipeline company. That company, Hiland Partners, is a former affiliate of Continental that was taken public but subsequently bought by Hamm. That history provides important context because earlier this year Continental signed a $95.8 million deal for pipeline capacity on an unnamed and unbuilt oil pipeline with Hiland. While the deal was fully vetted to avoid conflict of interests, it is one of many recent related-party transaction between Hamm and Continental. Other examples include the $23 million purchase of its headquarters building by Continental and the acquisition $340 million in oil and gas assets from a company owned by Hamm and Continental's vice chairman. When things are good no one really cares what goes on. It's when things turn south that other risks such as questionable related-party transactions are brought to light and compound the problems. While low natural gas prices exposed the debt issues at SandRidge and Chesapeake, the media attention surrounding the related-party transactions has kept the lid on the shares of both companies. It can take the market a long time to get past these practices after they've been questioned. We, through our wholly owned subsidiary Grizzly Holdings, own a 24.9% interest in Grizzly. The remaining interest in Grizzly is owned by Grizzly Oils Sands, an entity owned by certain investment funds managed by Wexford Capital LP, or Wexford. An affiliate of Wexford owned approximately 13.3% of our outstanding common stock as of December 5, 2011, and approximately 9.5% as of March 13, 2012, which ownership was reduced to less than 1% as of September 28, 2012. You'll see similar disclosures in almost every transaction Gulfport completes. This was most recently seen when Gulfport acquired 22,000 acres in the Utica from an affiliate of Wexford for $220 million, or $10,000 an acre. While the Utica still appears to be a great play and Gulfport's acreage is in the sweet spot, it paid a lot of money for those acres. This is a story that could go either way, if the Utica turns out to be as good as or better than Gulfport expects then the relationship with Wexford will have turned out to be a tremendous asset. However, if Gulfport starts to perform poorly, investors could begin to question these deals. That's why as an investor you have a tough choice to make. You can see these related-party relationships as something to avoid as it adds another layer of risk. On the other hand, these relationships could turn out to be very beneficial as the related parties tend to have a significant vested interest in the company's success. That's why I'd encourage you to dig a bit deeper into an independent oil and gas company before you buy to make sure you are comfortable with any related-party relationships before you've invested your hard-earned money.